A lot has happened since I last wrote you. I traveled to Australia and raced the 100 and 200 metre breaststroke at the Pan Pacific Games. It was a pretty bizarre racing experience because it was outdoors and pouring rain, so… very cold. I managed to swim a bit better than I did at Commonwealth Games, and qualified for the final in both races. Again, I wasn’t thrilled with the results, but happy that I was able to improve a bit, and finish the year off on a positive note. At this point for me, it’s about putting the 2013-2014 swim season behind me, learning from the downs and getting excited about the possibilities that the new swim season holds. Competing at the Pan Am Games in July 2015 in my home town would be a once in a lifetime experience that I plan to get the chance to not only do, but excel at. World Championships will be immediately following the 2015 games in Russia, and a very important competition leading into the 2016 Olympics. But first…. it’s about qualifying for the national team at the Canadian National Trials in April (also held in Toronto). We just had a couple weeks off structured training which was much needed (mentally more than physically). I backpacked through Australia for about 10 days with some friends which was a great way to get my mind off the pool for a little while to reset for the coming season. We hit up Byron Bay, did a boat trip in the Whitsunday Islands and finished off in Sydney. I loved all of it. When I got home, my older sister Ally got married, so we had a great weekend celebrating as a family and then the weekend after that I headed to Dominican Republic with some friends to clear my head before the next swim season officially started up. It was a great break, and by the time I got back to Toronto I was itching to get back into the pool. I’ve been working a lot with RBC lately since I missed some hours being away and I’ve had some great opportunities. I’m working and learning a ton in the Brand Marketing Team at head office. I’ve been able to make some great connections and really get to know the team over the past year. 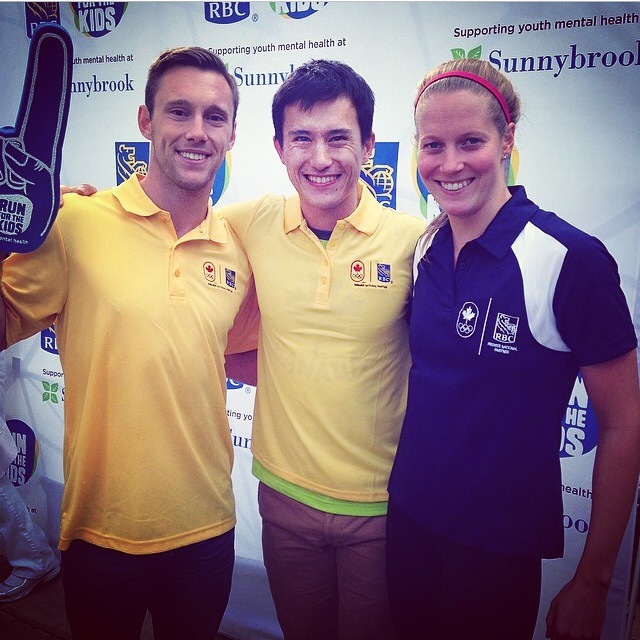 I also ran in the RBC Run for the Kids which is a big event to support kids mental health. My goal going into it was to run under 20 minutes for the 5km and I managed to run a 19:45 🙂 I then had the opportunity to mingle and reconnect with RBC executives and other Olympians. It was a great event and I highly recommend running it if you get the chance to in future years. I’m excited to have a good stretch of training at home in Toronto now after a huge summer. I head to the world short course championships in Qatar in the first week of December. At the beginning of October I begin training at the new PanAm pool in Scarborough so I’ll have to buy a car. I’m looking to do some speaking engagements at this time to help make a few extra bucks as well, so if any one/company you know might be interested, please let me know! Time for a little redemption in the pool, here’s to a GREAT 2014-2015 swim season!